For people looking for a natural way to treat ailments or diseases, Turmeric is one of the best supplements for you. Turmeric has been used for centuries in natural medicine and it has been known to heal health problems such as; stomach ulcers, inflammation, high cholesterol, bad circulation, colitis, skin disorders, Alzheimer’s and even cancer. There is no need to spend money on expensive, risky pharmaceuticals when there are multiple natural products available to treat the aforementioned issues. 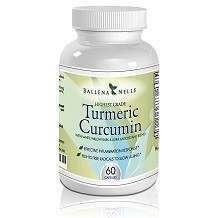 One Turmeric product available is Ballena Nelle Turmeric Curcumin, which is claimed to provide a highly potent curcumin. Curcumin is the active ingredient in Turmeric that provides most of the health benefits of the plant. The manufacturers state that Bellena Nelle Turmeric Curcumin contains a C3 curcumin formula, boswellia and willow bark. These ingredients provide extra health benefits such as; minimizing damage of free radicals, join pain relief, better liver health and function, better cardiovascular health and immune system support. There was an also an independent test conducted by a company that ensures the products quality guarantee. If you are interested in the mentioned benefits, Ballena Nelle Turmeric Curcumin may be a good product to try. The manufacturers recommend that two capsules be taken each day to ensure maximum benefits are achieved. It is highly recommended that customers seek advice from a health care practitioner prior to taking any supplement. The price of Ballena Nelle is $53.77. If purchased from Amazon there is a 50% discount offered which reduces the price to $ 25.77. One bottle contains 60 capsules and is approximately a one month supply of the product. There is no clear information regarding the manufacturers product satisfaction guarantee. Therefore it is at the customers risk if they purchase this product, as it is likely that no monies will be refunded by the manufacturer. Overall Ballena Nelle is a decent turmeric supplement available to the public as it contains potent ingredients and the essential active ingredient – curcumin. However, the regular price of the product is very expensive when compare to others available. There is also no product satisfaction guarantee and with the extra ingredients in the product, some people may find it is too many things packed into one supplement. The manufacturers do not provide evidence that that product is produced in an FDA approved facility or that it is free of chemicals or pesticides.